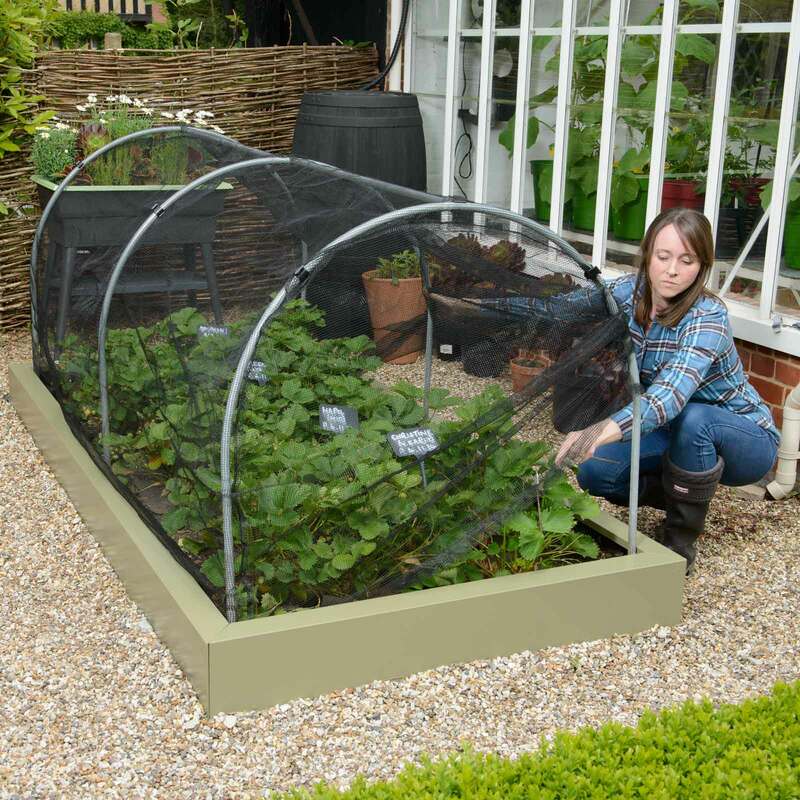 Our Fitted Hoops and Butterfly Net Cover Kits for our Superior Metal Raised Beds will put a stop to caterpillars ravaging brassicas and are designed to fit neatly inside our New Steel Raised Beds for an easy plant protection solution. These Fitted Hoops and Butterfly Net Cover Kits will put a stop to caterpillars ravaging your brassicas in the kitchen garden or at the allotment, turning your cabbages, cauliflower, broccoli and brussel sprouts plants into butterfly free zones. The 19mm diameter galvanised tubular steel hoops fit securely inside the Superior metal raised beds, supplied with brackets and screws and available in various size options from 0.6m x 1.2m (2ft x 4ft) right up to 1.2m by 2.4m (4ft x 8ft) and supporting the 7mm mesh butterfly fitted cover. These fitted, tailored and stitched seamed covers take the hassle of grappling with awkward pieces of net and are available in six size options. But don't restrict your zero tolerance butterfly policy to raised bed growing (although designed for use in our beds), the Fitted Hoops and Butterfly Net Cover Kits are equally at home in open ground. Please Note - these kits are designed for our Superior Metal Raised Beds and will not fit our Wooden Raised Beds. EXTRA VALUE OFFERS - Great savings on complete hoop and butterfly net cover kits! 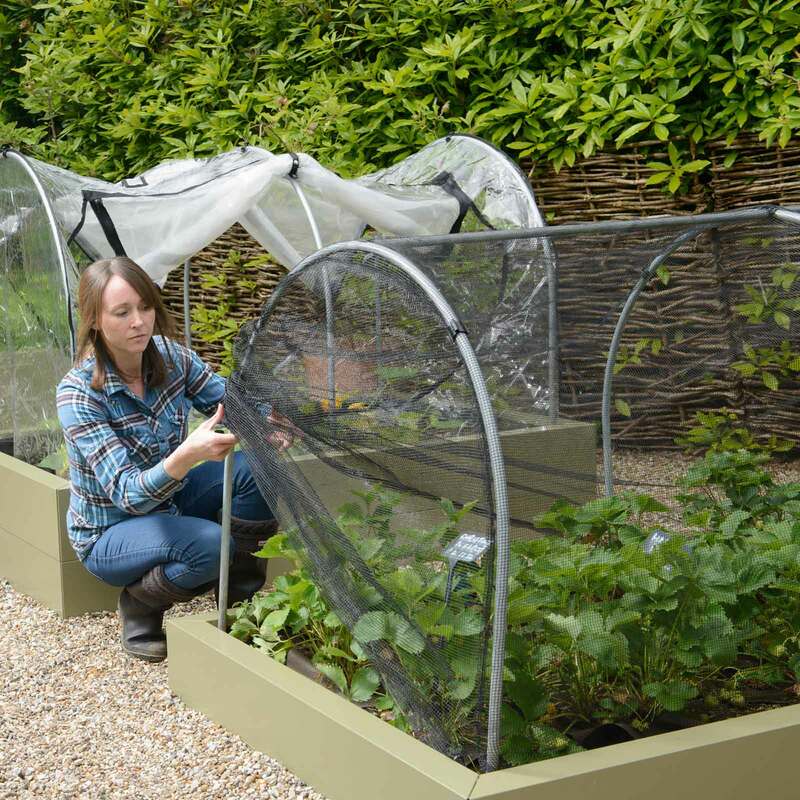 These new Hoop & Cover Kits will fit only our new metal raised beds, and the covers - Butterfly Netting and PVC/Mesh Netting provide you with seasonal protection for your crops. 4ft long beds = 2 hoops - 6ft long beds = 3 hoops. 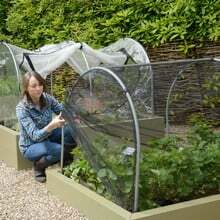 Butterfly Netting covers have a strong, soft and pliable 7mm knitted mesh size and will keep out the Cabbage White Butterfly and birds too. Our Mesh Vented PVC covers lets you start growing earlier or extend the season. 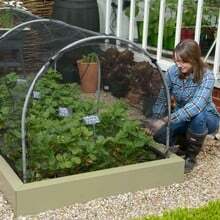 It combines strong, extra thick UV stabilised PVC with large zipped full width dual skinned PVC & insect-mesh panels on both sides. Unzip to reveal the insect-mesh panel or fully unzip and roll up for direct access. UV stabilised for longevity, it allows air and water to circulate, provides shade and protects against weather elements - including mild frosts.